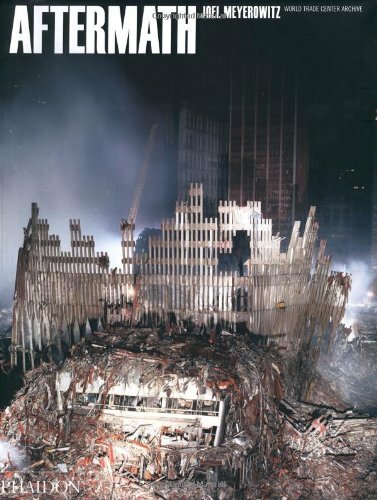 For 9 months, during the day and night, Meyerowitz photographed "the pile," as the World Trade Center came to be known, and the over 800 people a day that were working in it. Influenced by Walker Evans and Dorothea Lange's work for the Farm Security Administration during the Great Depression, he knew that if he didn't make a photographic record of the unprecedented recovery efforts, "there would be no history." Sept. 23. Assembled panorama of the site from the World Financial Center, looking east. 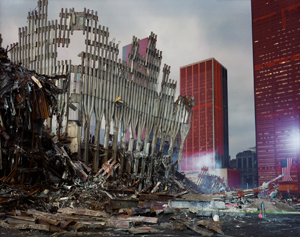 (All images copyright Joel Meyerowitz from Aftermath: World Trade Center Archive (Phaidon). Sept. 25. The south wall of the South Tower. Oct. 11. 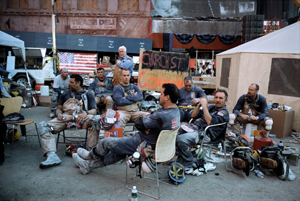 An FDNY rescue team resting on Liberty Street. Nov. 8. Spotters in the South Tower. May 1. Ralph and Paul Geidel waiting for a fresh raking field. Marking the 5th anniversary of September 11th, Phaidon Press has published this extraordinary new book AFTERMATH: THE WORLD TRADE CENTER ARCHIVE with photographs and text by Joel Meyerowitz, which will feature, for the first time, the vast collection of Meyerowitz’s previously unpublished photos from Ground Zero along with the engaging account of his experience in his own words. 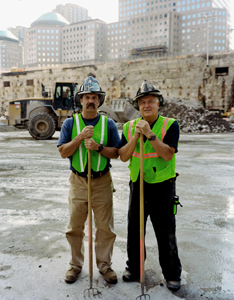 This historic publication is the only existing photographic record of the monumental recovery efforts post-9/11. From portraits of the people he met to the accidental beauty of the ruins at dusk, AFTERMATH features 400 breathtaking color photographs, many taken with a large format camera. Bronx-born Meyerowitz brings his trademark sensitivity, intelligence and eye for beauty to these poignant images that will hold an important place in American history. AFTERMATH brings to life the tireless determination of the scores of individuals who assisted in the clean-up process, including construction workers, police officers, firefighters, welders or "burners," engineers, crane operators and volunteers. Presented on a monumental scale, and interspersed with fascinating stories, the book documents the transformation of the site chronologically from piles of devastation to an empty pit six stories below ground. This landmark book offers current and future generations the opportunity to finally travel inside a forbidden city where thousands were brought together by a common cause. "I was taking pictures for everyone who didn't have access to the site," says Meyerowitz in AFTERMATH, "so I decided to work with a large-format wooden view camera. This camera was impossible to hide, but it enabled me to make images of the fullest description, with a sense of deep space. I wanted to communicate what it felt like to be in there as well as what it looked like: to show the pile's incredible intricacy and visceral power.... I could provide a window for everyone else who wanted to be there, too--to help, or to grieve, or simply to try to understand what had happened to our city." 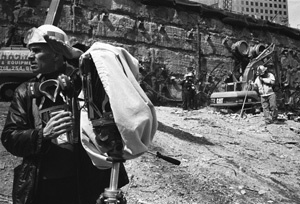 The World Trade Center Archive, consisting of thousands of Meyerowitz's images, is part of the permanent collection of the Museum of the City of New York where it is available for research, exhibition and publication. 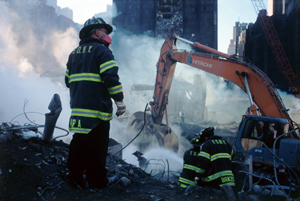 For the past few years, a small selection of these photographs was featured in an exhibition, "After September 11: Images from Ground Zero," which traveled to more than 200 cities in 60 countries, reaching over 3.5 million people.